Firenze Gardens, 5218-5230 Sunset Blvd., William J. Dodd, architect. Photographer unknown, ca. 1922. From Los Angeles Public Library photo collection. 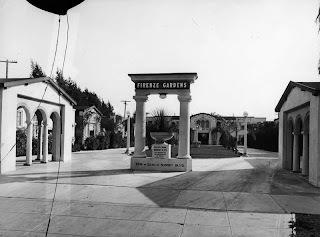 While in Los Angeles during July 1921, Frank Lloyd Wright stayed at the Firenze Gardens Apartments (see above and below) for a few weeks while checking on the status of his nearby Olive Hill projects and meeting with Barnsdall. 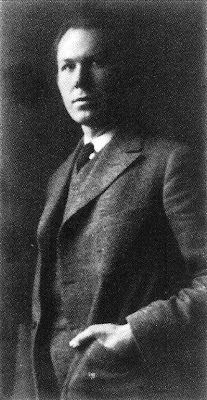 Firenze Gardens was designed by William J. Dodd for whom Frank's son Lloyd (see below) periodically performed landscape design work between 1914 and 1921. (Lloyd Wright, Architect: 20th Century Architecture in an Organic Exhibition by David Gebhard and Harriette Von Bretton, Art Galleries, University of California, Santa Barbara, 1971, pp. 22-24). Firenze Court ad, Arrowhead Magazine, February 1918. Lloyd quite possibly designed the landscaping for Firenze Gardens as he was at the time of his father's stay designing the landscapes for Dodd's personal residence and the residence Dodd designed for Kenneth Preuss in Laughlin Park (see below). Dodd's Firenze Gardens design received an Honorable Mention in Architect and Engineer's 1920 annual architecture awards competition. 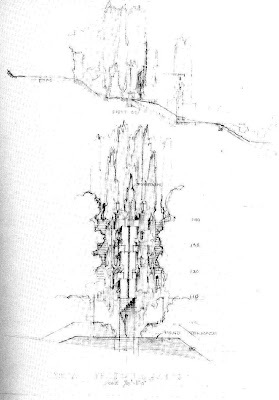 (Jennings, Frederick, "The Architecture and Landscape Architecture of Los Angeles and Vicinity," Architect and Engineer, August 1920, pp. 47-117. For much more on Dodd and Wright see my "Edward Weston, R. M. Schindler, Anna Zacsek, Lloyd Wright, Reginald Pole and Their Dramatic Circles"). Lloyd Wright, ca. 1920. From "The Blessing and the Curse" by Thomas S. Hines in Lloyd Wright: The Architecture of Frank Lloyd Wright, Jr. edited by Alan Weintraub, Abrams, 1998, p. 14. 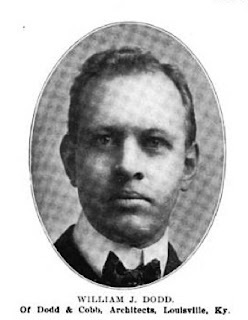 William J. Dodd, ca. 1902. From Wikipedia. Dodd was possibly known by the elder Wright from his earlier days in the Midwest and was also known to Schindler as Wright had asked Schindler to deliver his mail and update him on the status of contracts at Firenze, "the place that Dodd Built." (FLW pencil note to RMS, Frank Lloyd Wright, n.d., from Correspondence With R. M. Schindler 1914-1929, Special Collections Getty Research Institute). (Author's note: Dodd had recently been appointed by the Governor to the State Board of Architecture replacing retiring F. L. Roehrig. "Architect Named; W. F. [sic] Dodd Appointed to State Board by Governor," Los Angeles Times, October 24, 1919, P. II-11). Garden for W. J. Dodd, Laughlin Park, Lloyd Wright, landscape architect, 1921. Gebhard, p. 7. Dodd was just finishing remodeling his former palatial residence in Laughlin Park he sold to Cecil B. 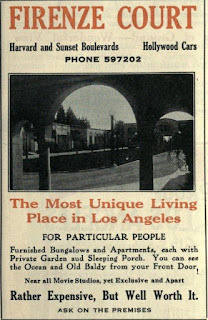 De Mille in 1919 and completing new Laughlin Park houses for Kenneth Preuss and himself, and the Pacific Mutual Life Building during Wright's stay at Firenze Gardens. Possibly unbeknownst to the senior Wright, the seriously Hollyhock-moonlighting Lloyd was commissioned by both Dodd and Preuss to design the landscapes for their Laughlin Park estates (see above for example). 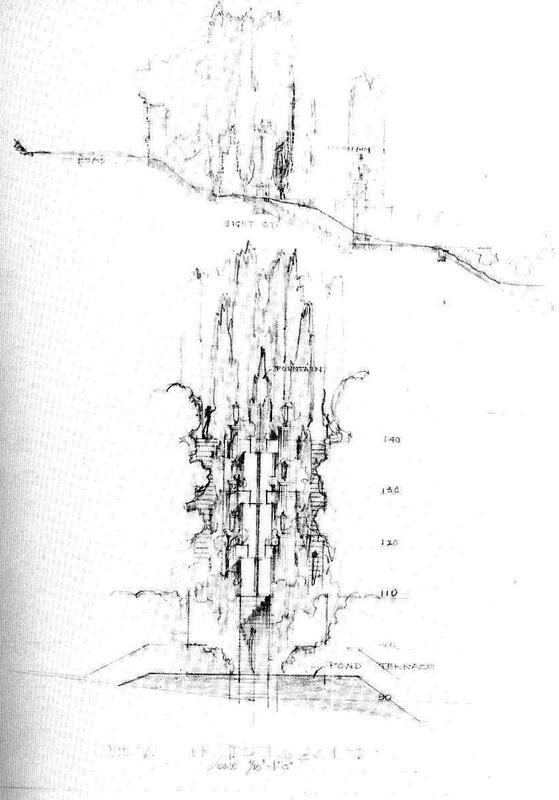 (For much more on Lloyd's relationship with Dodd whom he most likely met while working for Irving Gill on the Laughlin Park subdivision planning in 1912-13 see my "Irving Gill, Homer Laughlin and the Beginnings of ModernArchitecture in Los Angeles, Part II, 1911-1916"). 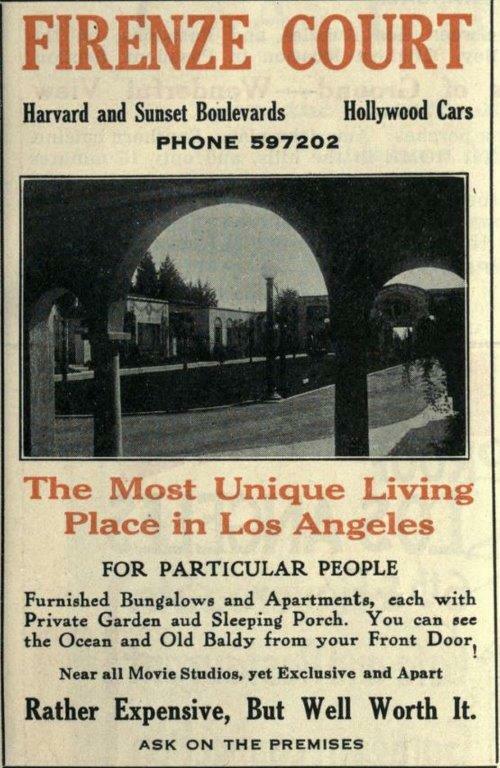 "Dodd's buildings are to be found in the old downtown financial district around Pacific Center, around Hollywood in Laughlin Park and Hancock Park, to the west in Rustic Canyon and Playa del Rey, Long Beach, San Gabriel, and Altadena." (Wikipedia). 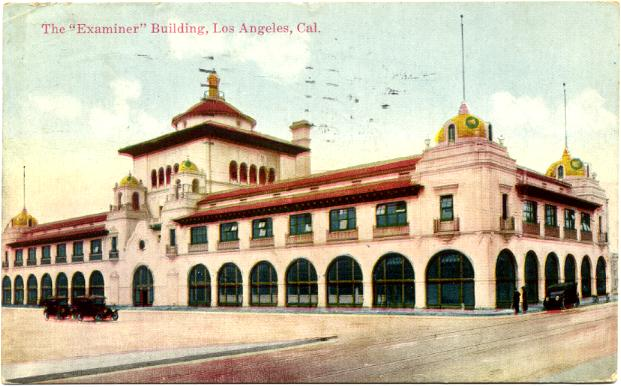 Los Angeles Herald Examiner Building, 1915. 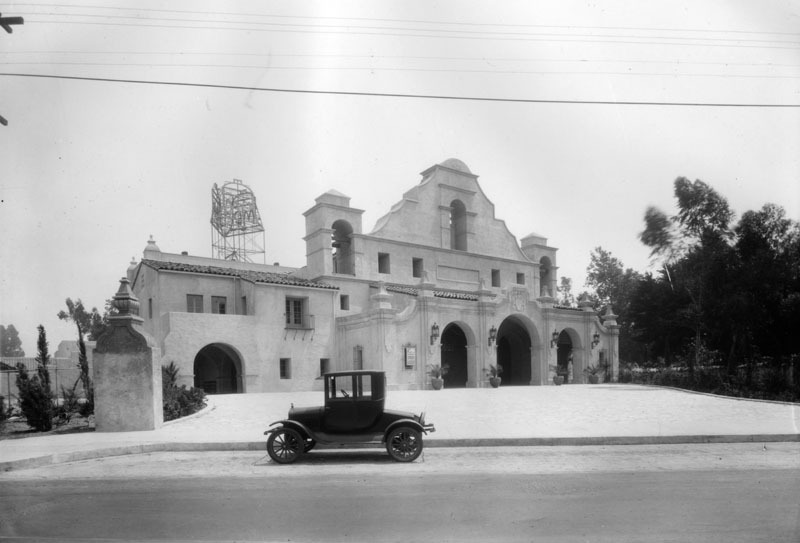 Julia Morgan, William J. Dodd and J. M. Haenke, architects. "From as early as 1893, and to the end of his life, Dodd was a mentor to talented younger designers who were new to the profession, designers with now well-known names like Lloyd Wright, Thomas Chalmers Vint, and Adrian Wilson, often outsiders without a developed practice and contending with a new client base and fast evolving licensing standards in cities enjoying rapid expansion as was Louisville after the American Civil War and Los Angeles after World War I. The architect Julia Morgan, a mostly free-lance architect from upstate San Francisco, and rare as a female in a male-dominated domain, formed a team with W. J. Dodd and J. M. Haenke as her Los Angeles facilitators and design partners for William Randolph Hearst's Los Angeles Herald-Examiner Building, a landmark downtown project completed in 1915 (see above)." (Wikipedia). San Gabriel Mission Playhouse, San Gabriel, 1927. Dodd & Richards, architects.